Posted on March 30, 2012 by Elizabeth E.
Okay, this was me this week. 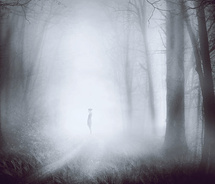 Lost in a fog. I even forgot to post on WIP Wednesday, which is usually like a religion to me. Suspected sinus infection. Exhaustion. Suffering from What-Day-Is-It-itis. Verified Foggy Brain condition. But today, the sun it out, the day is pleasant and I have a mani-pedi scheduled in an hour. All’s good. 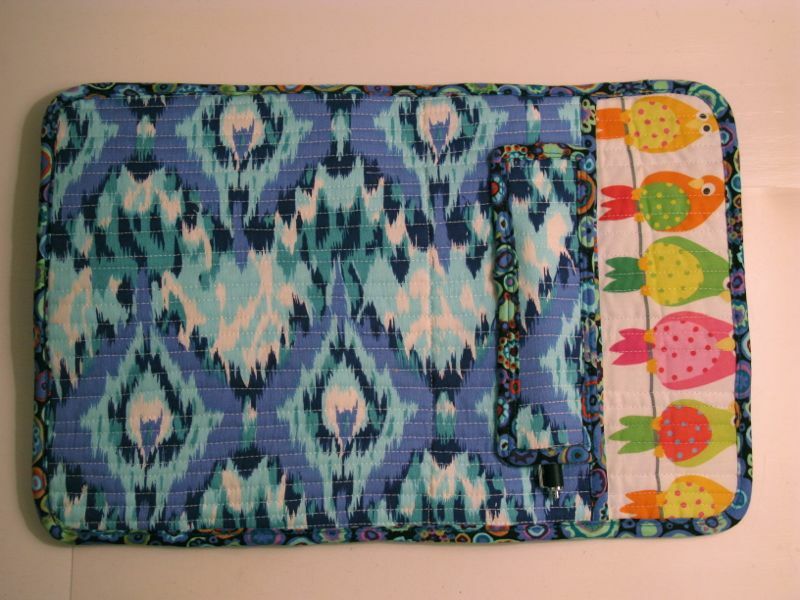 And I finished up my iPad cover. Somehow. 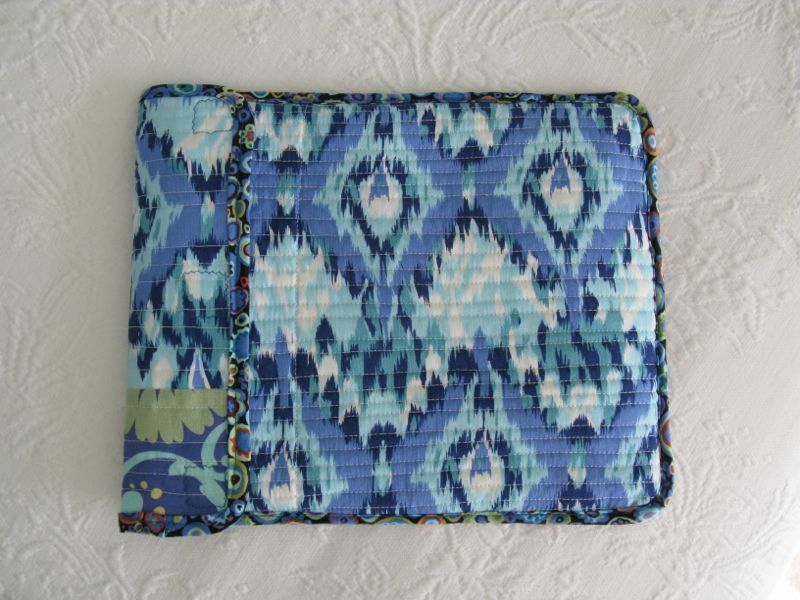 A blue ikat with a little happy surprise inside. Front. Front, with flap open and shy little orange bird looking all coy. Like an idiot, I cut it too close (there were some alterations after I had it quilted–double rats!!) 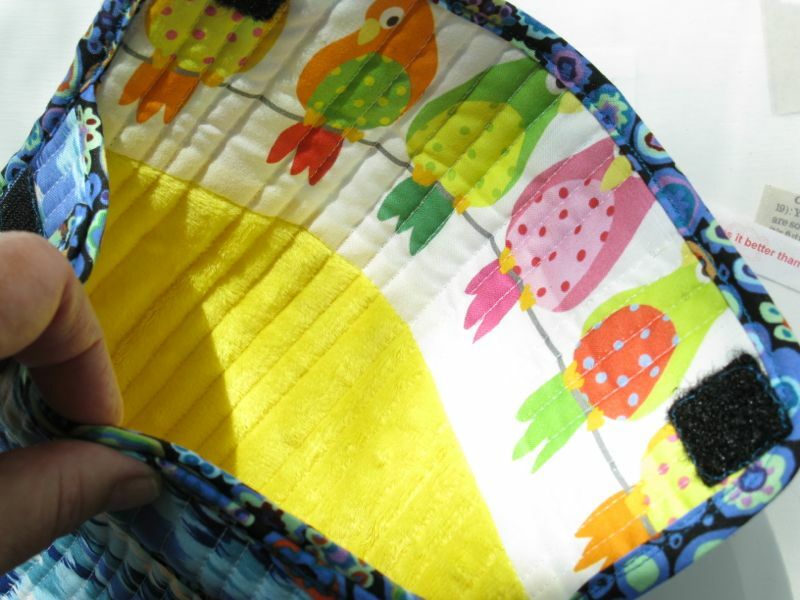 and the other birds are peering out from underneath the bias edge binding. But I love them all anyway. Velcro sticky dots, which ruined a needle (you’re warned). And the treasures peeking out: the iPad and a stylus. Okay, I’m enjoying my iPad, but I love my laptop. I’m sure it’s like anything–takes a while to figure it out and get it under your techno skin. Whack off a piece of fabric (I pieced the back for a little “interest” as shown here) about 3″ larger on all sides than your iPad. 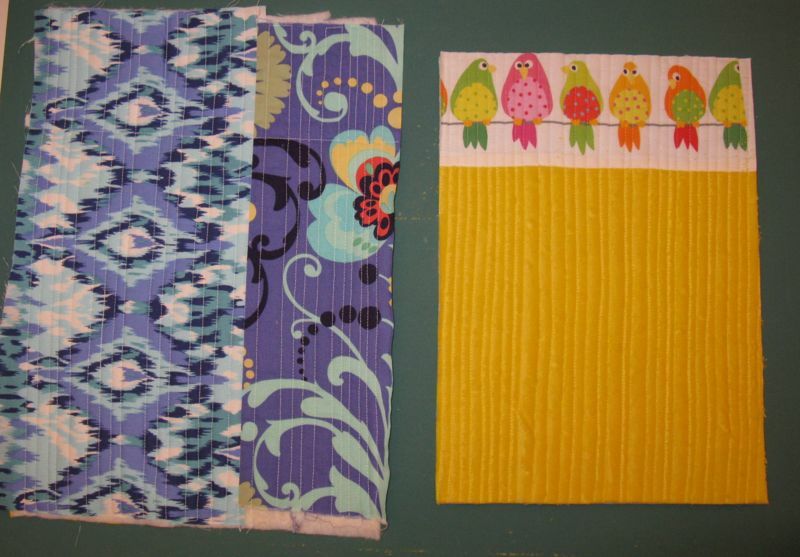 The piece on the left is row-quilted in varying widths. The piece on the right is trimmed up. I flipped over the trimmed up piece so you could see that I am lining this with some birdy fabric on the upper edge and using Minky down below. I thought I should lay them out to show you what my final dimensions were before I sewed them together (yep, I’ve already started with the binding). The back, which includes the extra for the flap is 13 1/2 ” tall and 8 3/4″ wide. 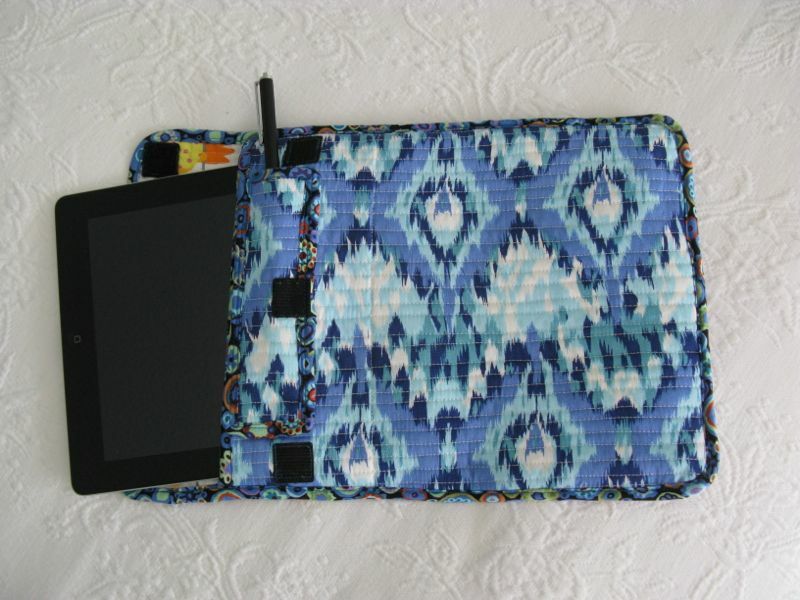 The stylus case is 6″ by 1 3/4″ and the front is 11″ tall by 8 3/4″ wide. 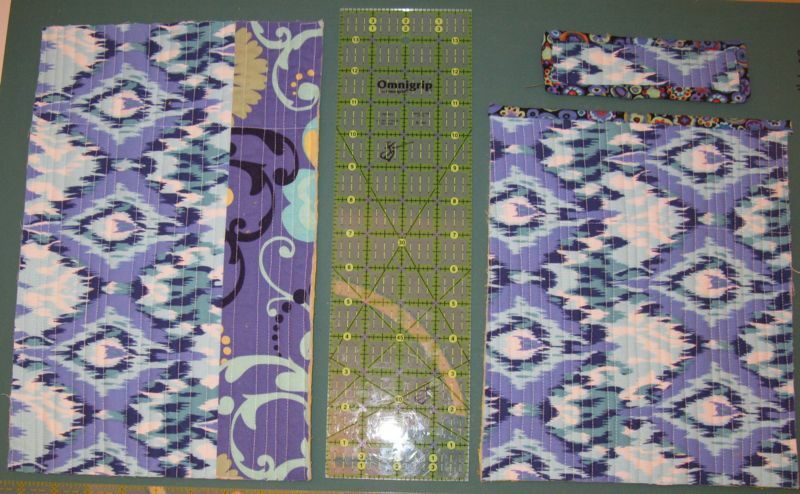 I think the “body” pieces could be cut to 8 1/2″ wide if you want a bit snugger fit. The way it is now, there’s some skootch room (the one I made for my husband is skin tight, but he says it’s fine). 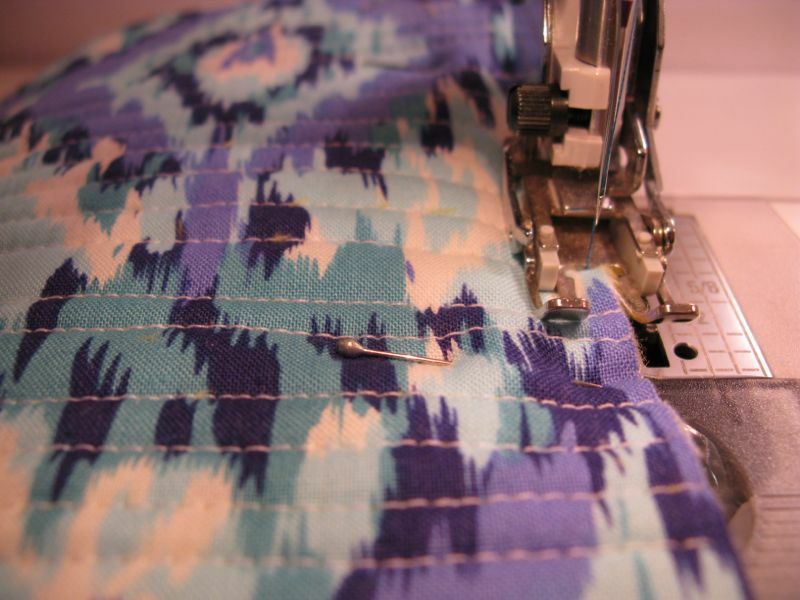 Make your binding by cutting a bias piece of fabric 1 1/2″ wide. I seamed a bunch of strips together to make one long piece (add up the dimensions if you must have an accurate length–I’m guessing mine was in the 45-50″ length). Take it to your ironing board and press all seams OPEN, then press it in half along the length. Now press both raw edges in to the ironed fold, making double-fold bias tape. I offset the folded edges slightly, so that when I laid it against the raw edge of my quilted piece, the back would be slightly longer. Bind the upper edge of your shorter body piece. Bind around the stylus case. I left those edges square. That was a nutso thing to do, so on the back body piece, I wised up and placed a spool of thread to mark a rounded edge. Sew on the stylus case on the front, centering it. Stitch around three side, leaving the side open. I realized I would be slipping this case in and out of my school bag/church bag/whatever purse when I put it into use, so I tried to incorporate the stylus case where it would be out of the way, yet accessible. Now line up your front, shorter piece on top of the longer, back body piece WRONG SIDES TOGETHER, leaving the extra on top (where my birds are) as the flap. Stitch down one side, using a 1/4″ seam allowance, then across the bottom, then up the other side, stopping where the front body piece ends. 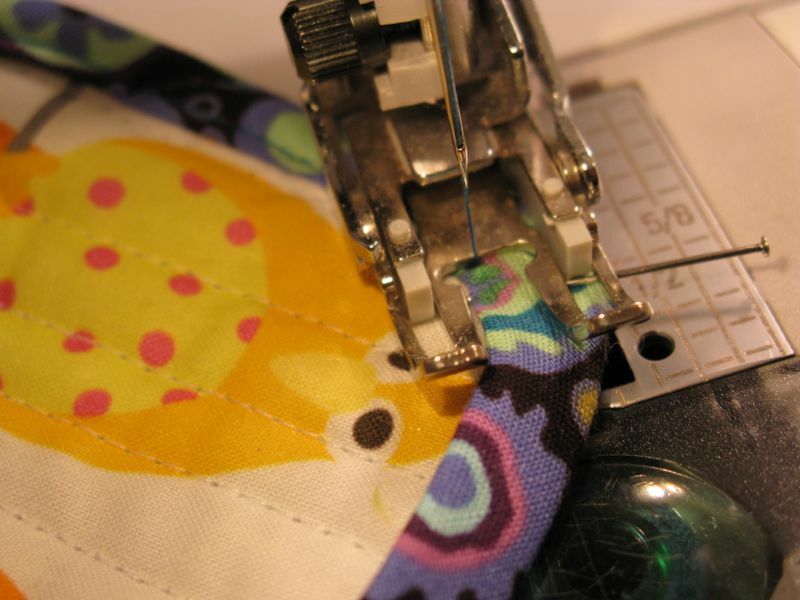 Begin stitching on the binding about 2″ down from the fold of the flap. Here I’m going around the flap outer corner, and that sweet yellow bird is keeping an eye on me. The bias binding really goes smoothly around corners. After sewing on the bias, turn it over and try not to curse when you notice all the places that didn’t get caught in your sewing. Re-stitch those, which is another reason why I chose a colorful fabric for my bias binding. It hides mistakes. I had not planned to put on Velcro dots, preferring instead to simply fold it over, but row-quilted fabric apparently has a mind of its own, and it’s comparable to a two-year old’s who wants the Skittles from the back of the cupboard. So on they went, obscuring two of my favorite birds (rats!). I ended up putting a third dot in the middle, hand-stitching it to the stylus case, but machine stitching it to the flap. So now I can be cool with my ikat fabric cover. And not worry so much. I may yet get a black foldable cover but I looked at the ones in my local store and wasn’t that thrilled with them. This is fine for now. And I’m out of the fog! 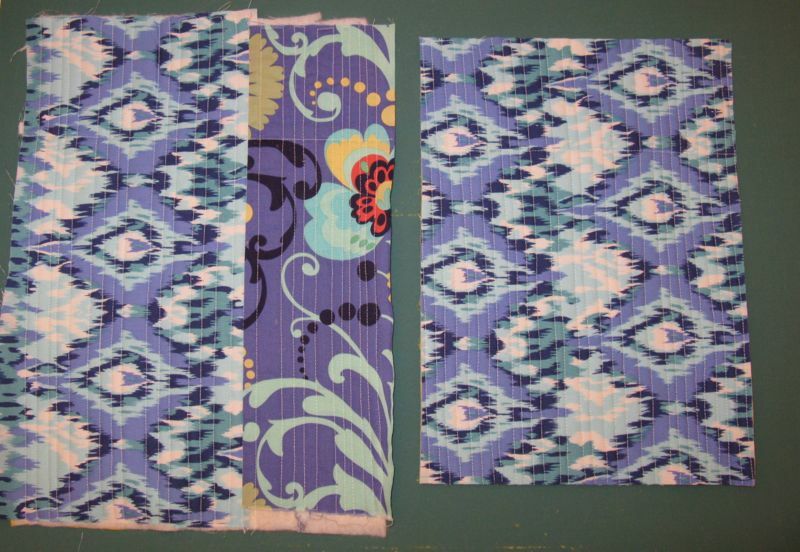 Happy Quilting this weekend. E, it’s so nice to see my little birds in such a wonderful finished product! 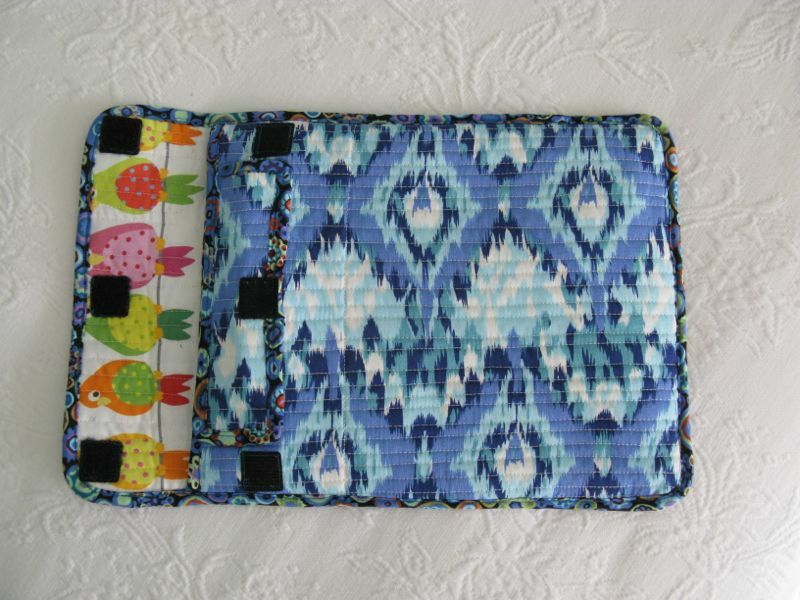 I’ve been trying to make an iPad case since the first of the year, but life has gotten in the way. And now I have new inspiration – your tute. 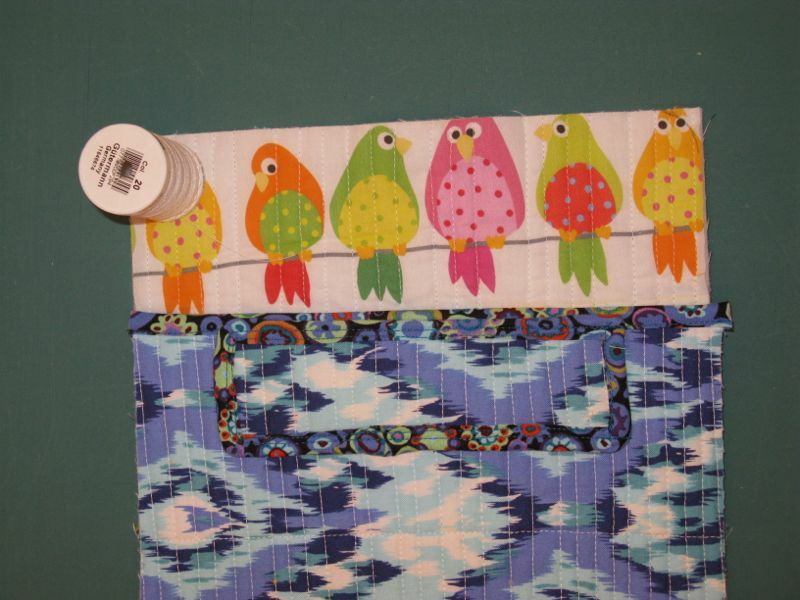 is great, I have some Lark fabric, and still have some birds – how cool! Thanks for using it and displaying – always a treat.